Throughout it all, the American theater – that art form playfully referred to as “The Fabulous Invalid” (the title of a 1938 play by Kaufman and Hart) – has not only survived but thrived in the face of every dire prediction. And in his new book, “Rise Up! Broadway and American Society from ‘Angels in America’ to ‘Hamilton,’” Chris Jones – my colleague-on-the-aisle in Chicago since the 1990s – has chronicled the era in a singularly creative way, bringing to bear his prodigious gift for tapping into the nexus of artistic innovation, the business of show business, new forms of audience engagement, and (as the book’s title so clearly proclaims), the political fevers that can emerge during a given period of history. Chris Jones Though British-bred, Jones has covered the American theater scene for decades, working for Variety during the 1990s, and, since 2002, serving as the prolific chief theater critic and columnist for the Chicago Tribune. His editors clearly understood the enduring power of Broadway, as well as the vital pipeline that runs between Chicago and New York, and they invested heavily in his coverage of the work being done in both cities, and beyond. This book easily justifies their investment. It wasn’t until 1993 that “Angels in America,” playwright Tony Kushner’s two-part, six-hour epic, arrived on Broadway, although the AIDS epidemic at the core of its story had been raging in the U.S. since the early 1980s. This is the work with which Jones begins his book, and although he duly pays homage to “The Normal Heart,” Larry Kramer’s 1985 work on the same subject, he makes it clear that the arrival of “Angels” was a singular event. And along the way it ventured far beyond AIDS to draw on everything from the early 20th century wave of immigrants, to the collapse of the Soviet Union in 1989, to the fallout of Cold War politics and McCarthyism, to the identity politics of insiders and outsiders, whether closeted or uncloseted homosexuals, Jews, Mormons, Communists, anti-Communists or something else. To be sure, Broadway has never been just a source of escapist entertainment (think of everything from “Death of a Salesman” and “A Raisin in the Sun” to “Cabaret” and “Assassins”). But “Angels” captured the temper of its time in a fascinating way, and audiences clearly wanted to be part of the experience. Serving as the other bookend in “Rise Up!” is the mega-phenomenon of Lin-Manuel Miranda’s musical, “Hamilton,” which arrived on Broadway in 2015, midway through Barack Obama’s second term as president. By casting this country’s Founding Fathers with non-white actors, and suggesting the brilliance of their ideas by setting their songs to the most sophisticated musical and verbal version of hip-hop, Miranda and his collaborators devised another kind of historical fantasia. And in doing so, they also generated something of a rare cultural frenzy, capturing the imagination of young, multicultural audiences in a way that producers could never have dreamed about. Of course, in the intervening years there were many other superb and exceptionally successful shows that galvanized audiences in their own distinctive ways. And Jones, who possesses an uncanny sense for tapping into “the buzz” that can attach itself to any given production, revisits many of them, supplying just enough background and backstage lore to make their genesis spring to life. There is Jonathan Larson’s musical “Rent,” which put a millennial twist on Puccini’s “La Boheme” as it homed in on the lives of struggling artists and their lovers in New York’s East Village in the late 1980s, and dealt with drugs, AIDS, homelessness, gentrification and romance. Taymor did a whole lot more, too, creating a show that will be all but impossible to fully replicate in post-Broadway productions. There is one moment in Jones’ quarter century of theater history that takes the form of a real life nightmare, and that is when the terrorist attacks of Sept. 11, 2001 hit New York and shook the world in ways that continue to reverberate. The show that inadvertently became a most surprising sort of “Rise Up!” response to that shattering event turned out to be “Metamorphoses” – a magical envisioning of Ovid’s recounting of Greek transformation myths. And it was the work of director Mary Zimmerman, the unique artist who forged her career in Chicago, and initially directed this show for Lookingglass Theatre. Already in rehearsal when planes smashed into the World Trade Center, “Metamorphoses” opened off-Broadway barely a month later, and moved to Broadway shortly thereafter. Staged in and around a pool of water, it captured something beautiful, painful and surprisingly healing. And Jones suggests how it lifted audiences out of their shock and grief with a poetic “Rise Up!” spirit unlike any other. Along the way, Jones makes a detour to Las Vegas, where Cirque du Soleil thrived and Broadway musicals never quite found traction, but this feels a bit off the “Rise Up!” track even if it suggests the parallel universes that can exist in show business. In addition, what he describes as the “renaissance” of Edward Albee – a volcanic theatrical force of the 1960s – is essentially an homage that (to my mind at least), makes too much of a heavy-handed new play, “The Goat,” but acknowledges the powerful Broadway revival, via Steppenwolf, of “Who’s Afraid of Virginia Woolf?” On the other hand, you could argue that the Albee discussion effectively sets the stage for the 2007 Steppenwolf-generated production of Tracy Letts’ “August: Osage County,” whose look at extreme family dysfunction clearly struck a chord with audiences and came with strong echoes of Albee’s earlier “Rise Up!” style. I would have been more than happy had there been only the briefest mention of Taymor’s giant flop, “Spider-Man: Turn Off the Dark” (although you might say it presaged the current return of interest in superheroes). And I was sorry to see no mention of director David Cromer’s surprising off-Broadway hit – the Chicago-bred revival of “Our Town,” the Thornton Wilder chestnut that captured the attention of jaded New York audiences in a remarkable new way in 2009. 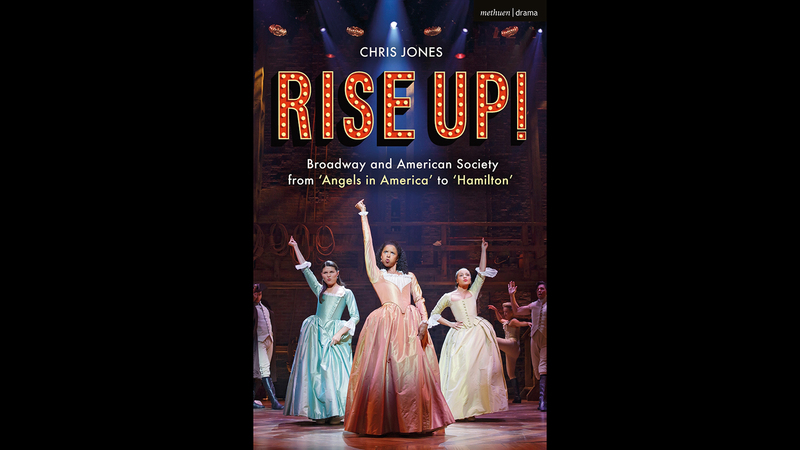 But whether you booed or applauded for all or some of the many plays and musicals discussed in “Rise Up!” there is no denying that Jones has vividly caught the unsettled spirit of the times in which they came to the stage. And given the wildly melodramatic nature of our current moment on this planet he leaves you wondering just where the theater might be headed over the course of the next 25 years.